Renee Scattergood is an indie author, currently publishing a dark fantasy serial called Shadow Stalker. She’s been writing since the mid 90’s, but it’s been an on again off again relationship with writing: partly due to her own fears, and partly due to unforeseen circumstances getting in the way. Overcoming her fears has been key to getting her career as an author off to a positive start and onto a path to success. This was a hard question to answer because I’ve never really thought about style. I just write. But when I stopped to consider it, I realized I do have a style of sorts. When I tell a story, I like to do it as though I’m telling it to a friend. Before I started writing stories, I used to make stories up in my head and tell them to my friends (at least the ones who would listen). So when I began writing them, it was natural for me to write them that way. I don’t think I’ve had it yet. I’m not sure I ever want to because once you reach that high point the only way is down, and I never want my career to go down. One of the best things to happen to me so far though is all the friends I’ve been made in the last year. Being an indie author is difficult because you have so much responsibility. You’re responsible for every aspect of the process. The most important thing I’ve learned is that doesn’t mean you have to do it alone. The online indie community is the most supportive and helpful community I’ve ever been a part of, and it just keeps getting better. I get really frustrated with editing, but I’m trying to change the way I look at it and make it just as fun as the rest of the process. It helps having a great editor to work with who you can share your frustrations with. I have a hard time with titles and coming up with ideas for book covers too. In fact, that tends to make me want to scream more than editing does. ? A lot of my ideas for stories (or parts of stories) come from dreams I have. Shadow Stalker was born a bit differently though. I was reading The Celestine Prophecy and the idea for my character Kado popped into my head. I knew from the start he wouldn’t be my main character. He was going to be a guide and teacher to the main character, but he influenced the entire plot for the serial. I’m writing Part 3 of my Shadow Stalker serial, and publishing it by chapter on Patreon. I’m also in the editing process for a novella I wrote about one of the characters in the serial for entry into a bundle that will be sold for charity in 2017, tentatively called Makari’s Mission. And I’m in the planning stages for a series of novels, Savior of the Serpent Isles, which takes place in the Shadow Stalker world. The first book, The Galvadi Invasion, will be released mid-2016. 6) Of all the characters you’ve created, which is your where to buy doxycycline in bangkok favourite… and why? That’s a hard one. I like all of my characters. If I had to pick a favourite, I’d have to say Cali. She’s a minor character and plays a pretty small role, but she has an incredible personality and unique way of looking at the world around her. She’s very witty and spunky. And she helps the main character, Auren, to adjust to the new life she’s been thrust into. Unlike some people, I wasn’t actually afraid of failing. I was afraid of success. More to the point, I was afraid of the responsibility that comes with success, especially interacting with the public. I’m not shy, exactly, but I have a hard time being social. I’m not always sure of what to say or how to act. I was also worried I wouldn’t be able to handle everything that needs to be done with regard to publishing a novel. What I did to overcome that was to start small. Originally Shadow Stalker was meant to be a series of novels, but publishing a novel seemed too daunting. So I came up with the idea of writing it more like a TV Series and focusing on just one character. Each episode is only about 10k words, so it didn’t seem so scary. It was a great way to test the waters and build up my courage about interacting with readers. Over the last year, I’ve been having such a great time with it all, it seems silly that I was ever afraid, but I think any time you’re working on overcoming a fear, taking baby steps is the way to go. Renee Scattergood lives in Australia with her husband and daughter. She’s a homeschooling mother and loves spending time playing games, watching movies and doing science experiments with her daughter. Her daughter has been diagnosed with ASD and ADHD, so she has to balance caring for her daughter and her writing career, which can sometimes be difficult, but it doesn’t stop her. She enjoys the challenge and loves the unique way her daughter sees the world around her. Check out her website, Renee Writes, to learn more about her and her writing, as well as reading articles on her experiences as an indie author and what she is learning throughout the process. She also provides weekly Author Spotlights for Science Fiction and Fantasy authors, as well as other promotional opportunities on her website, so check it out. She also has a blog called Renee’s Author Spotlight, where she features indie and small press authors (any genre). Marketing opportunities are rare for writers who self-publish, so this is her way of helping out the online indie community and allowing them to get the word out about their work. It’s also a great place for readers to find their new favourite author. Parts 1 and 2 of Renee’s serial are available for purchase on Amazon, Smashwords and other online retailers. 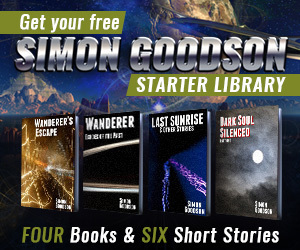 Part 1 of Shadow Stalker is permanently free, so download a copy today. If you like it, you can also get Part 2 free by signing up to her newsletter for updates and subscriber only giveaways and other goodies. A great interview. I’m always interesting to find out more about the authors of my favourite series.